Pain Eaters is perhaps best described as a cross between X-Men and Hellraiser. In other words an action horror tale with more emphasis on the action aspect. We are plunged straight into the action as Jack Fugazi is caught bang to rights surrounded by bodies. However, all is not as it seems and Jack gets the chance to tell his story from an interrogation room. It is clear that Tooker knows how to spin an excellent story. The only very minor negative I have to offer is that for me it seemed perhaps a tad too short. I felt that we could have had a little more of the back story behind Jack and the villain known simply as the German. However, take this as a complimentary statement it shows that the author had engaged me completely in his world. I wanted to explore more of this strange world where good and evil sorcerers with strange incredible powers contest for supremacy. Tooker had me hooked with his strong descriptive writing and I'm hoping that he takes the hint from this reviewer and sets a few more stories in this fascinating world that I'd love to see more of. 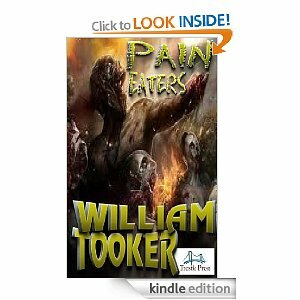 If you like an interesting blend of action, magic, horror and superheroes then you'll enjoy Pain Eaters as much as I did. A very enjoyable read that I would recommend. A five star read for me as I felt it was original, very engaging and compellingly told.